The beauty of a water region make tourists forget a busy daily life. Visiting Tien Giang, aside from a slow and peaceful life, you can enjoy a wide range of fresh fruits. Now Travelling Tien Giang Rivers- Enjoy Peaceful Life. From Hanoi, there are many buses to get Ho Chi Minh city. From Ho Chi Minh city, it is easy take bus to get My Tho (Tien Giang) because there are many buses a day. My Tho city is just 70 km from Ho Chi Minh city and you just spend one hour discovering this city. A vast river area of Tien Giang. A simple life in this water area will make tourists forget a busy daily life. Vinh Trang Pagoda: is the biggest Buddha pagoda in Tien Giang province. The pagoda is designed as a sample of Asia and Europe architect styles. The pagoda was built in the beginning of 19th century including many valuable wooden statues which are finely sculptured. 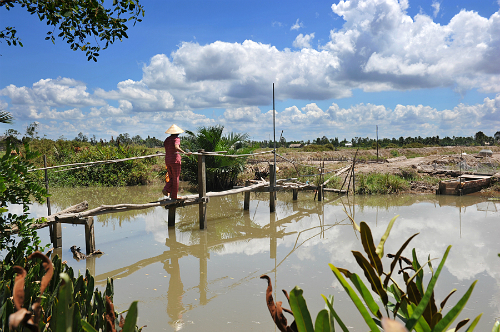 Thoi Son Tourism Area: Visiting Mekong Delta Rivers, tourists cannot miss out isles full of fruits. It takes about 40 minutes of sailing on river, you can get Thai Son isle, sailing downstream channels through water coconut trees, visiting fruit orchards, and picking up fresh fruits. 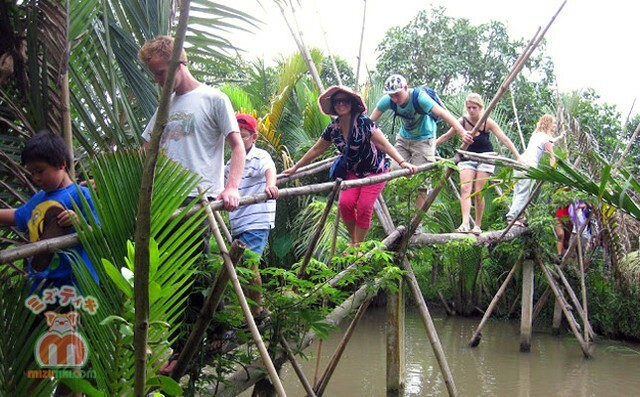 This is one of typical tourist attractions of Mekong Delta. This destination welcomes thousands of tourists every day. 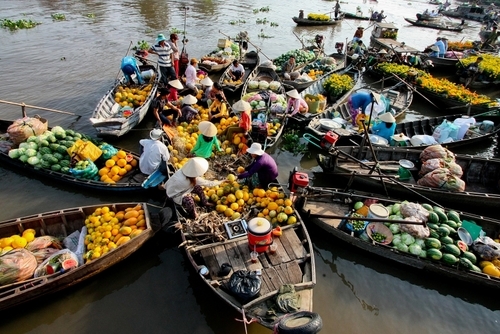 Cai Be Floating Market: The market is always packed with buyers and sellers and a purchasing center to transfer fruits to surround regions. Every day, there are hundreds of boats full of fruits go back and forth. Cai Be has the biggest number of fruits in Tien Giang. 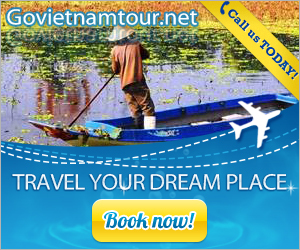 Boats from Ho Chi Minh city, Ca Mau, Vinh Long, An Giang, Can Tho come here to purchase good. Tan Phong isle (Con Cu) in Dinh Vien commune, Long Ho district includes six small islands with a total area of 2,430 hectares. Tan Phong looks like a blue pearl among Tien river with heavy silt. It is also known for big and sweet rambutan orchards. This is a miniature image of Southwest region which attracts tourists with orchard civilization. Tan Thanh Tourism Area: if you want to sunbathe, you can get Go Cong Dong district, about 50 km from My Tho city. This place has a 7-km long sand beach, from here tourists can use motor boat to get Con Nhang where you can sunbathe and enjoy yourself in a cool water or play sports on water surface. Dong Tam Snake Farm: about 12 km from My Tho. This is a center of raising poison snakes for export and combining with growing medical plants for treat snake’s bite for people in Mekong Delta region. In addition, this is also a beautiful garden and a warm nest for kinds of bird and precious animal at Southern region. Rach Gam- Xoai Mut Relics: from the snake farm, go straight 7 km along provincial highway 864. It is a place where King Nguyen Hue fought against Siamese military and got a glorious win. The craft village of shrimp paste in Go Cong is dubbed royal dishes, one of 52 dishes used in the Nguyen court. This dish is made from pureed shrimp, compared with spices and dried, and gives a special flavor of Go Cong sea. Fine art craft village: altar cabinets are mainly made in Go Cong and made of precious wood. This craft requires skillful and master craftsmen. There are a few hotels and hostels in My Tho; hence you can find to Ly Thuong Kiet street, Ap Bac. This average price is VND 150,000/ night. 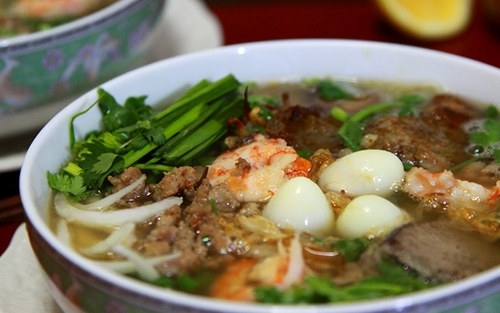 Rice noodle with chicken broth: the sweetness of the broth and the tenderness of meat are blended which is hard to resist. Rice noodle with chicken broth is rustic dish of southern people. Bean sprout cakes: familiar materials such as rice powder, pig liver, and raw bean sprout. Pieces of inflated cake are crispy and attractive. Horseshoe crab in Go Cong Dong: Horseshoe crabs are prepared and then placed on charcoal, grilled until fragrant. 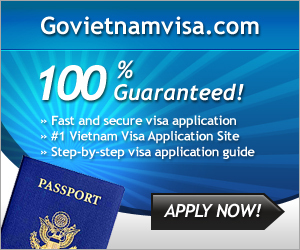 Vietnam warmly welcomes you to enjoy Vietnamese cuisine and to make your trip in smooth water, turn your plan into real by quick hands to obtain Vietnam visa at http://govietnamvisa.com and for Vietnam eTicket at http://vietnamairlines247.com.